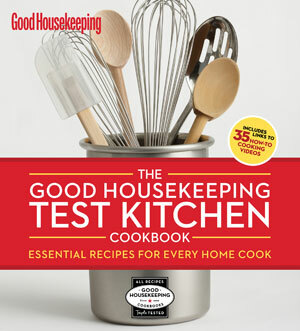 Just in time for this holiday's cooking season, the experts in Good Housekeeping magazine's test kitchen who check out the latest in ovens, stoves and other cooking gear have arrived with help: the newly published The Good Housekeeping Test Kitchen Cookbook (Hearst Books; October 2011; $19.28 on Amazon.com) and its accompanying online instructional videos that you can play on your smartphone while toiling in your own kitchen. The 690-page ring-bound book contains 375 printed recipes plus an assortment of 35 barcodes that, when scanned, lead to the videos, which provide step-by-step guidance through additional recipes as well as related "how-to" advice. On page 170, for example, a barcode accompanying the recipe for "Turkey with Roasted Apples and Gravy" leads to a video that offers an easy recipe for "Best Do-Ahead Gravy." And other barcodes call up videos with tips for baking "Healthier Holiday Cookies" or onthe best way to store and ship cookies. Only the free Microsoft Tag smartphone app will scan and read these barcodes, according to a spokeswoman for the cookbook's publisher, but this app is widely compatible with the iPhone and Android, BlackBerry, Windows Phone 7, Windows Mobile, Symbian and J2ME based smartphones. Alternatively, links published next to the barcodes take you to the videos in any web browser. Each recipe in the book has been cooked at least three times to assure it will yield good results no matter which brands of ingredients or appliances are used in the preparation, Susan Westmoreland, Good Housekeeping's Food Director, says in the book's Foreword. So, while not every dinner guest of yours may like what you serve, you can at least proclaim that it bears the Good Housekeeping seal of approval.